Is this the future of the hypercar segment? The Bugatti Chiron. The Koenigsegg Agera RS. The Mercedes-AMG Project One. The Aston Martin Valkyrie. The Hennessey Venom F5. These are the names of five of the most prominent performance cars of 2017. 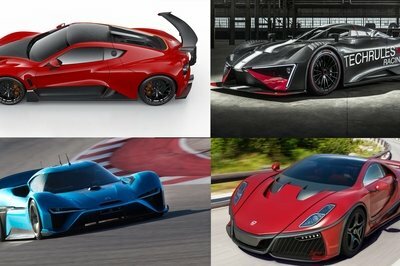 Yet somehow, not one of these cars can lay claim to being the most bonkers car to make its debut this year. 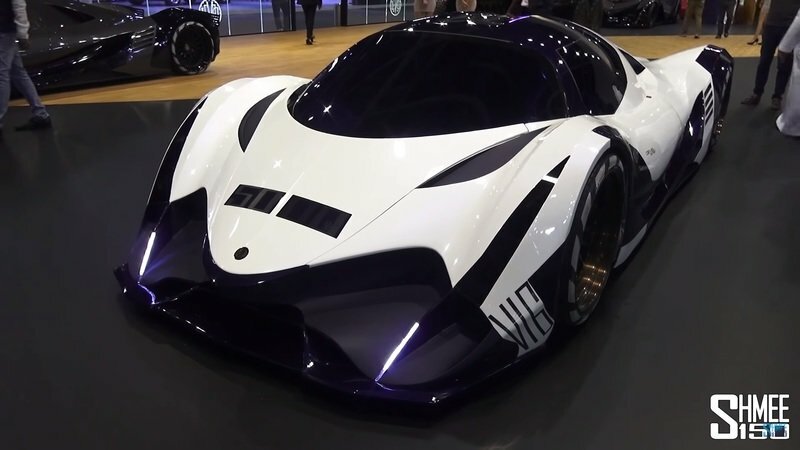 That title belongs to the Devel Sixteen, thought to be nothing more than a mythical figment of the imagination when the prototype was introduced to the public four years ago. That was back in 2013 when the Devel Sixteen first became “something.” Four years later, it’s more than just “something” now; it’s the real deal. It only takes one look at the car before you realize that you’re looking at a machine that could revolutionize the supercar/hypercar segment the same way cars like the McLaren F1 and the Ferrari F40 did two decades ago. It’s too early to say if the Sixteen has that potential, but the numbers being thrown around by Devel are completely unheard of. Think the Chiron is powerful by having 1,500 horsepower at its disposal? 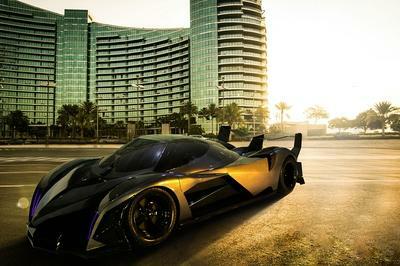 Well, Devel claims the Sixteen has 5,007 horsepower. 5,007! That’s more than three times the power produced by Bugatti’s latest crown and jewel! Think this current race-to-300-mph is worthwhile to follow? The Sixteen may soon render that race irrelevant with claims that it can hit 350 mph without even breaking a sweat. At some point, the hypercar will have a lot to prove when it finally gives us a taste of what it’s capable of. Until then, we’re going to sit here with bags full of salt, waiting for Devel to show us what the Sixteen is really all about. 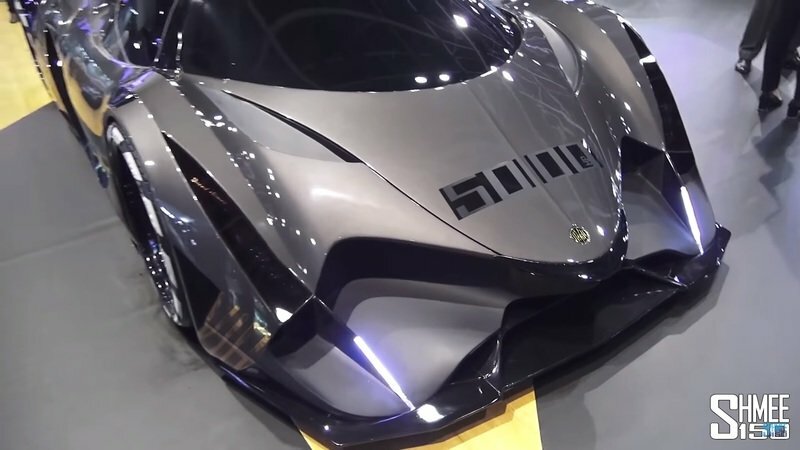 The prototype version of the Devel Sixteen left little to the imagination as the prototype’s outrageous design provided us with a good preview of what’s to come. 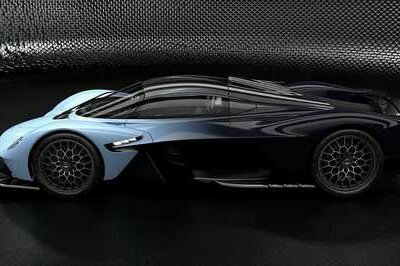 But as is the case with concepts like the 2013 version of the Sixteen, Devel did a lot of massaging on the production version’s design. The result is no less spectacular as the 2017 version looks every bit the part of a supercar sent from outer space. The new-look Devel Sixteen is an exercise in quality car design. The car looks particularly long and stretched, emphasized by how the body swoops around as if every panel is wrapped around another panel. The front end remains properly ludicrous with the short yet sharp nose, the massive front spoiler that sits close to the ground, and the eccentric way the headlights are packaged. Move to the sides and you’re greeted with the sweeping wheel arches, the extended body lines, and the plethora of intakes and air ducts that are all over the car’s body. I suppose if you’re carrying a V-16 engine underneath that body, you’re going to need all those intakes and cooling ducts. The rear section of the hypercar fits in with the demented theme of the body. The rear wheel arches actually have fins on top of them, a unique take to an otherwise old design trick that allows minimal disturbance to the air flow that hits the car. It’s interesting too how this section focuses on the two exhausts that look more like jet turbines. They’re so big that you can probably fit your head inside one of them and still have plenty of room to spare. 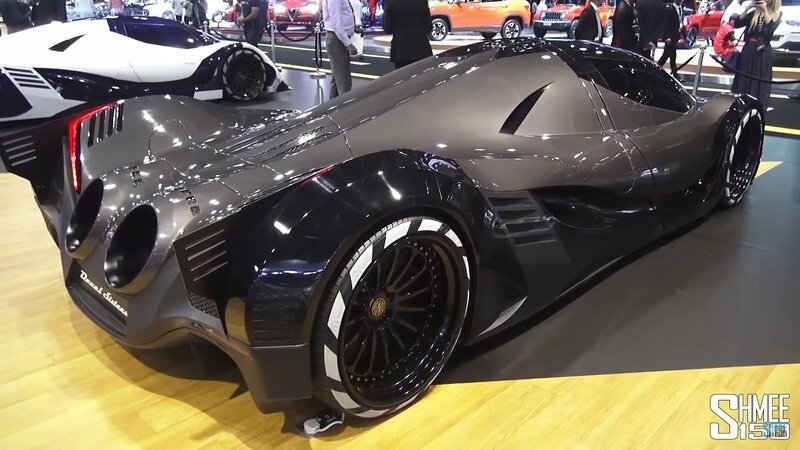 If the production version of the Devel Sixteen really looks like this, it’s going to redefine the way cars of this status will be looked at in the future. It is fitting that Manifattura Automobili Torino (MAT) is partly responsible for the car’s design. After all, this is the same firm that had a hand in building cars like the SCG 003 and the Apollo Intensa Emozione, two exotics that looked every bit the part of supercars in their own right. 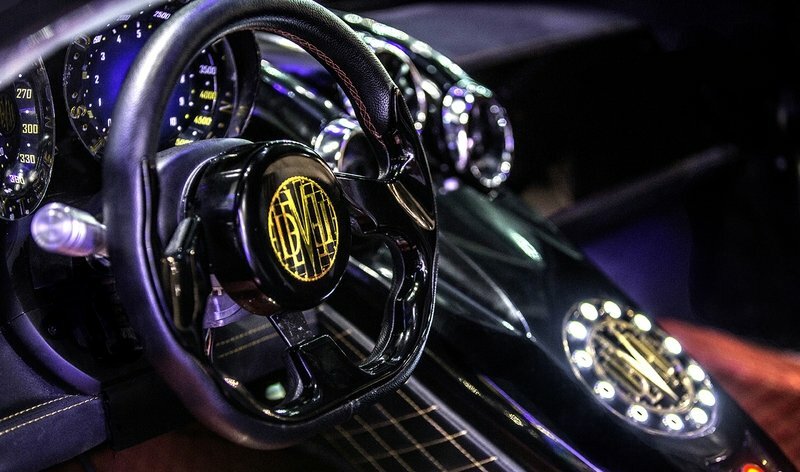 The interior design of the Devel Sixteen is a far departure from the exterior design of the hypercar. Whereas the latter invoked a serious amount of emotion, the cabin is less distinguished. There are still some futuristic elements to it, including the tablet-like steering wheel and the carbon shell seats that sit so close to the floor, but for the most part, Devel adopted a more minimalist approach in the latest version of the hypercar. I’m still not sure if that’s a good thing or a bad thing, but if it the car performs as well as it’s been hyped, I don’t think the interior’s going to matter as much. I’m not going to beat around the bush with this one. The Devel Sixteen, for all of its eccentric design traits, will forever be defined by its promise to perform like no other car in the history of the world. The first big revelation is the car’s engine. Somehow, someway, the Devel Sixteen is carrying a 12.3-liter V-16 quad-turbocharged engine. 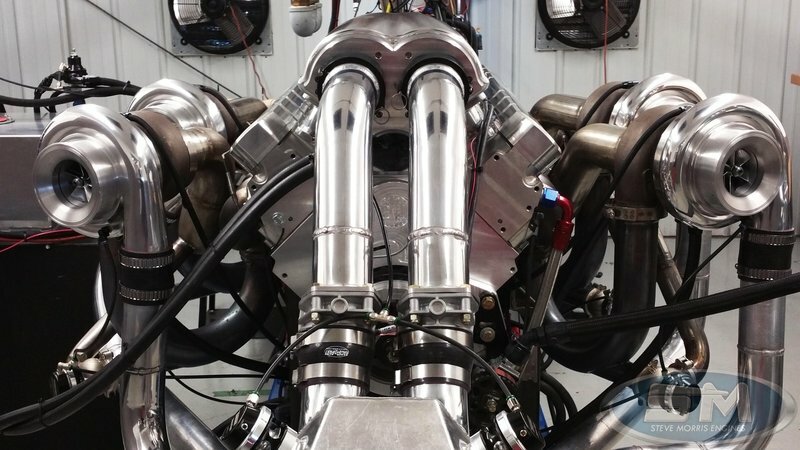 That’s the kind of engine you normally see in heavily tuned drag racers. If your minds aren’t blown yet, then prepare yourselves for this do of a revelation. According to Devel, that massive engine allows the Sixteen to tap into 5,007 horsepower and 3,519 pound-feet of torque worth of power. Gulp. Do the math and that’s more than three times the power output of the Bugatti Chiron, almost four times the output of the Aston Martin Valkyrie, and five times the power of the Mercedes-AMG Project One. Needless to say, the Sixteen isn’t a car for the weak-of-heart. Devel is even estimating that once the Sixteen is up and running to its fullest capabilities, it could reach a top speed of around 310 mph. As insane as that sounds, the real question to ask is whether it’s even possible to achieve that kind of speed on a car. Fittingly, that question has been thrown around a lot in recent months, largely due to significant movement from some of the biggest players in the supercar segment. 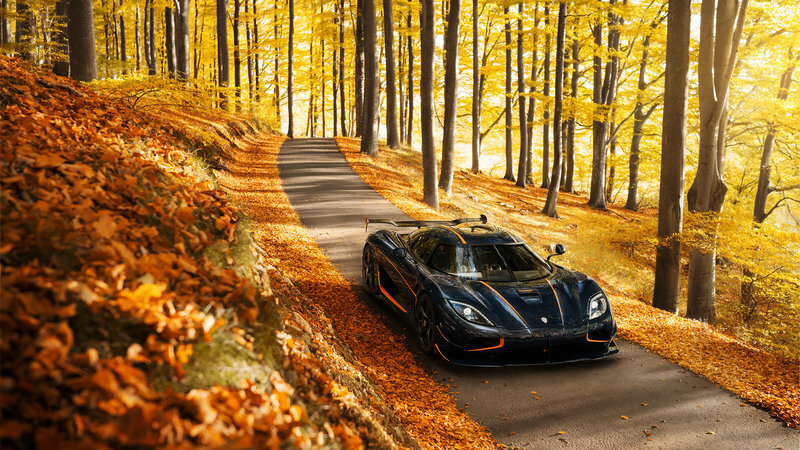 The Koenigsegg Agera RS recently broke the Bugatti Veyron Super Sport’s seven-year record after averaging a top speed of 277.9 mph. Bugatti hasn’t responded yet with a lap time of its own, but it says that the Chiron is capable of reaching 300 mph if the engine’s speed limiter was removed. Then there’s Hennessey and its Venom F5. It claims that 300 mph on the new hypercar is a lock, even if it hasn’t proven it yet. 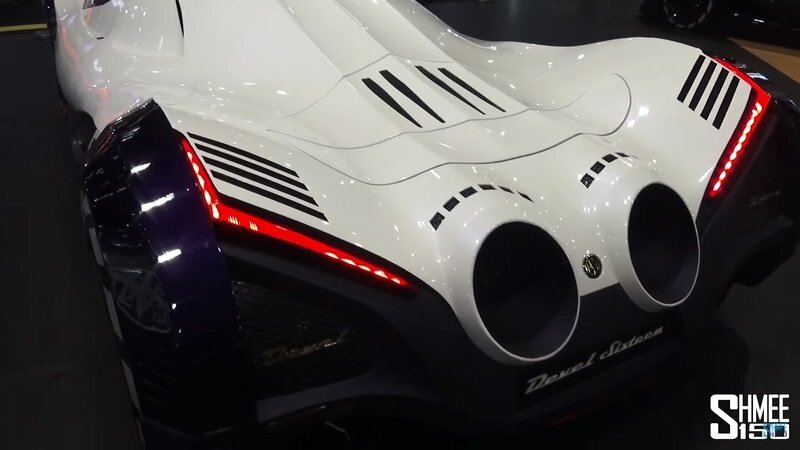 Devel is even estimating that once the Sixteen is up and running to its fullest capabilities, it could reach a top speed of around 310 mph. All of that jostling will be meaningless though if the Devel Sixteen somehow manages to back up its own claim of hitting 310 mph. That’s an attempt I’m definitely tuning in to watch. Normally, assuming a car’s price tag is easy because there are so many references and comparisons to cull from. But I’m not even going to make any attempts at guessing how much Devel plans to sell the Sixteen if it does end up in production. I don’t even know how many units Devel plans to build. All I know is that a car with this much technology in it, not to mention a monstrous 12.3-liter V-16 engine underneath, is not going to come cheap. $7 million? $10 million? Maybe even $15 million? None of it matters. If you’re interested in buying the Sixteen, you’re going to need to break the bank for this one. There once was a time when anything that Bugatti built was considered the cream of the crop among supercars. Times may have changed as legitimate contenders have arisen, but Bugatti’s ability to develop supercars remains the same. The latest proof of that is the Chiron. The successor to the legendary Bugatti Veyron is capable of a lot of things, none more important than its ability to produce 1,500 horsepower and 1,180 pound-feet of torque out of its 8.0-liter quad-turbo W-16 engine. That kind of power allows it to accelerate from an idle position to 60 mph in just 2.3 seconds before going on a speeding spree onwards to an electronically limited 261 mph. 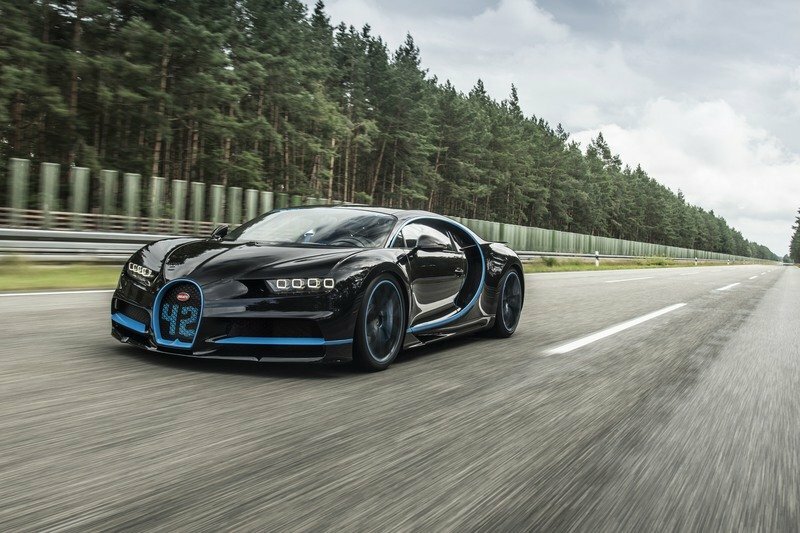 Even better, Buggati says that the Chiron is capable of approaching 300 mph if the aforementioned limiter is disengaged. It may lack the power of the Devel Sixteen, but it’s still a race I’d be glad to pay real money to watch. The Koenigsegg Agera RS is the current fastest production car in the world. 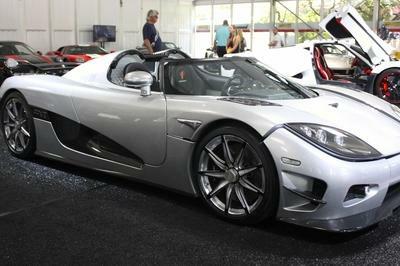 It also follows a long line of Koenigseggs that have taken the supercar industry by storm. The Agera RS fits the bill of a quintessential exotic. 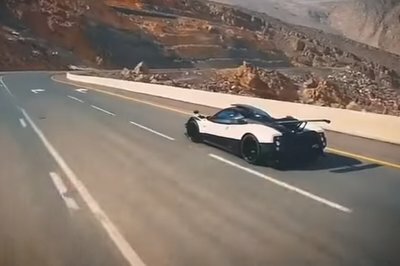 It was developed with nothing less than the latest in automotive technology, has 1,360 horsepower at its disposal, and just averaged a top speed of 277.9 mph to break the Bugatti Veyron Super Sport’s seven-year top speed record for a production car. Right now, the Agera RS is the man, and if the Devel Sixteen wants to be the man, it’s going to have to beat the Koenigsegg for that title. 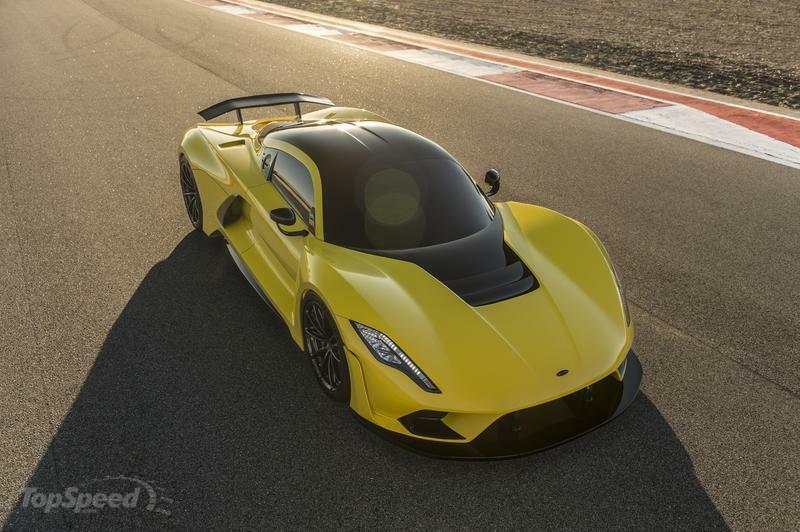 If I were to beat which car would come out with the fastest production car in the world title, my money’s on the Hennessey Venom F5. I don’t know enough about how far along Devel is in turning the Sixteen into an actual production car. I do know that the Venom F5 is here. Not only that, it’s heading to the party with a brand-new 7.4-liter V-8 engine that produces 1,600 horsepower and 1,300 pound-feet of torque. Hennessey has even teased us that its latest crown jewel can eclipse 300 mph. From the looks of things too, it’s closer than Devel to achieving that. Everything that Devel has shown us about the Sixteen points to a hypercar that will change the game forever. The narrative is all there waiting to be printed. All Devel needs to do at this point is to make sure that the Sixteen sees production. Once it gets to that point, all bets are off as far as who the king of the hypercars will be.